I would like to watch Jurassic World, which is out on DVD. Set Twenty-two years after the events of Jurassic Park, and Isla Nublar off the Pacific coast of Central America and starring Chris Pratt, Bryce Dallas Howard, B.D.Wong and Vincent D’Onofrio. It takes place in the fictional Jurassic World, which is now a fully functioning dinosaur theme park, as originally envisioned by John Hammond (Lord Richard Attenborough), which Gets 10 million visitors per year who travel about in motorised glass balls and has now been made completely safe. The park boasts many different habitats including an area called the Isla Nublar Lagoon which has it’s very own prehistoric Mosasaurs, these live alongside Apatosaurs, Tyrannosaurs, triceratops, Dimorphodon and Velociraptors(which look more like Deinonychus). Jurassic World is now owned by the Masrani Global Corporation however the novelty value has started to wear off with the public and visitor numbers are dwindling. So the management ask the park’s geneticists Claire Dearing (Bryce Dallas Howard) and Dr. Henry Wu, (BD Wong) to create a bigger and badder genetically-modified hybrid dinosaur, to renew public interest and boost visitor numbers to the park. So despite some serious misgivings from the cocksure Jurassic World Security man Owen Grady (Chris Pratt), They genetically engineer a new species of dinosaur by splicing genetic material from a T-Rex, Velociraptor, snake, and Chameleon. The result dubbed “ Indominous Rex” exhibits some rather alarming new abilities and is much smarter than previously thought. Needless to say it all goes horribly wrong when the creature manages to escape and it is not long before it is causing carnage, eating people and generally running amok round Jurassic World. Amidst all the chaos Two boys – Gray and Zach Mitchell (Ty Simpkins and Nick Robinson) find themselves in deadly peril and it is up to Owen and Claire to rescue Gray and Zack and deal with the “containment issue” before it eats all the visitors. The film was directed and Written by Colin Trevorrow co-written by Derek Connolly, produced by Patrick Crowley and Frank Marshall producing with Steven Spielberg, as executive producer. The film also starsVincent D’Onofrio, Omar Sy, Irrfan Khan, and Jake Johnson. On 15 0ctober 1928 the Graf Zeppelin made its first intercontinental trip, a 9,926 km (6,168 mi), 111 hour crossing from Friedrichshafen to Lakehurst with Dr. Eckener in command. Capt.Ernst Lehmann, who was tragically killed in the crash of the Hindenburg at Lakehurst eight and a half years later, served as First Officer on the flight and U.S. Navy LCDR Charles E. Rosendahl, commander of the ZR-3 USS Los Angeles (ex-LZ 126), made the westward journey. Despite encountering heavy headwinds and stormy weather, Eckener repeated the success of his first transatlantic crossing four years earlier when he delivered the LZ-126 to the U.S. Navy in October 1924 and was welcomed with a “ticker tape” parade in New York and an invitation to the White House. On the first transatlantic trip the airship suffered serious damage to its port tail fin when a large section of the linen covering was ripped loose With the engines stopped, the ship’s riggers did their best to repair the airship without falling into the raging Atlantic ocean below.The Graf crossed the U.S. coast at Cape Charles, Virginia, on October 15, passed over Washington, D.C., , Baltimore Philadelphia , New York City and landed at the Lakehurst Naval Air Station After the damaged tail was repaired, the Graf left Lakehurst for Germany at 1:24 am on October 29 and arrived back in Friedrichshafen on November 1. In 1929 the airship made two trips over the Mediterranean. On the first trip it carried 25 passengers and 16,000 letters to make four mail drops at Jaffa, Athens, Budapest and Vienna.The airship flew over Palestine, Egypt and Athens before returning to Friedrichshafen after completing a journey of 5,000 miles (8,000 km) in 81 hours.The second Mediterranean cruise flew over France, Spain, Portugal and Tangier. The airship returned to Friedrichshafen after flying north over Cannes and Lyons .Although the Graf Zeppelin ultimately had a safe and highly successful active career lasting nearly nine years, it also came close to disaster while making its second trip to the United States in May 1929, when the airship lost power in two of its five engines while over the Mediterranean off the southwest coast of Spain forcing Eckener to abandon the trip and turn back toward Friedrichshafen. Flying against a stiff headwind up the Rhône Valley in France the next afternoon, two of the remaining three engines also failed resulting in a loss of headway and the Graf being pushed backwards toward the sea.With Eckener desperately looking for a suitable place to force-land the airship, the French Air Ministry reluctantly advised him that he would be permitted to land at the Naval Airship Base at Cuers-Pierrefeu There the Graf Zeppelin would be kept in the hangar, Eckener made an emergency night landing at Cuers.After temporary repairs, the Graf returned to Friedrichshafen on May 24 where the engines were completely overhauled. it wasn’t until August 1, 1929, when the airship made another attempt to cross the Atlantic for Lakehurst, arriving on August 4. Four days later, the Graf Zeppelin departed Lakehurst for a complete circumnavigation of the globe. The Graf’s “Round-the-World” flight in August 1929 began and ended at Lakehurst Naval Air Station in New Jersey. Wealthy newspaper magnate Randolph Hearst ‘s correspondent Lady Grace Drummond-Hay was on board making her the first woman to circumnavigate the globe by air. Also representing Hearst among the passenger complement were Karl von Wiegand and Australian Arctic explorer Sir Hubert Wilkins, and photographer/newsreel cameraman Robert Hartmann. The US Government was represented by Naval airshipmen LCDR Charles Rosendahl and LT Jack C. Richardson A semi-documentary film entitled”Farewell” was released in 2009 which featured much of the newsreel footage of Lady Drummond-Hay shot by Hartmann during the flight. The film was later aired on the BBC under the title “Around The World by Zeppelin”.The Graf Zeppelin flew back across the Atlantic to Friedrichshafen to refuel before continuing across Eastern Europe, Russia, and the vastness of Siberia to Kasumigaura Naval Air Station on a 101 hour, 49 minute nonstop leg covering 7,297 miles (11,743 km). In 1930 the “Graf” made a special two-day round trip flight from Friedrichshafen to Moscow on September 9–10, 1930 landing briefly to collect souvenir mail at Moscow’s “October Field” however Crossing the inadequately mapped Stanovoy Mountains in Siberia proved to be a precarious venture with the Graf eventually being forced to climb to 6,000 feet in order to clear the range through a high mountain canyon with barely 150 feet to spare. After five days in Tokyo, the Graf continued across the Pacific to California crossing the coast at San Francisco before landing at Mines Field in Los Angeles thus completing the first ever nonstop flight of any kind across the Pacific Ocean, covering 5,986 miles (9,634 km) in 79 hours and 54 minutes. The 2,996-mile (4,822 km), 51 hour 13 minute transcontinental flight across the United States took the Graf over 13 states and such cities as El Paso, Kansas City, Chicago, Cleveland, and Detroit before arriving back at Lakehurst from the west on the morning of August 29, three weeks after it had departed to the east on August 8. Flying time for the four Lakehurst to Lakehurst legs was 12 days, 12 hours and 13 minutes while the entire circumnavigation (including stops) took 21 days, 5 hours and 31 minutes and covered 33,234 km (20,651 mi). 3RM Weltflug coin (1930A)Germany issued a special commemorative silver 3RM coin in 1930 in recognition of the Graf Zeppelin’s historic flight and Dr. Eckener became just the tenth recipient (third aviator) in 42 years to be awarded the Gold Medal of the National Geographic Society which was presented to him at the Washington Auditorium in Washington, DC. In May, 1930 the LZ 127 made its first visit to South America as part of a triangular flight between Spain, Brazil, and the United States. Providing passenger, express freight, and air mail service between Germany, Spain and South America was one function which was an early consideration in the design of LZ-127. It was intended in 1928 to offer passage between Friedrichshafen, Germany, and Rio de Janeiro, Brazil, The 1930 flight began at Friedrichshafen on May 18 and stopped first in Seville before leaving Europe. The Graf arrived in Brazil first at Recife (Pernambuco) docking at Campo do Jiquiá on May 22 before preceding on to Rio de Janeiro. The airship then flew back north to Lakehurst, NJ, before heading east over the Atlantic on June 2 to return to Germany with another stop in Seville. As with so many of its major journeys, the Europe-Pan American flight was largely funded by souvenir mails franked with special stamps issued by Spain, Brazil, and the United States .With the US already in the depths of the Great Depression, however, only about 7% of the very expensive stamps that had been produced had been distributed when the issue was withdrawn from sale on June 30. The Graf Zeppelin also visited Palestine in April 1929 and a second flight to the Middle East took place on April 9 1931 with a flight to Cairo, Egypt, where the airship landed less than two days later. After a brief stop, the Graf Zeppelin proceeded on to Palestine before returning to Friedrichshafen on April 23, just an hour over four days after departure. The trip took 97 hours, covered 9,000 km (5,600 mi) and crossed 14 countries on three continents. Shortly after the Hindenburg disaster America agreed to export enough Helium to Germany to permit the Hindenburg Class LZ-130 Graf Zeppelin II (which unlike the LZ 127 was designed to use either hydrogen or helium) to resume commercial transatlantic passenger service by 1939. However, firm opposition from the National Munitions Control Board, (which consisted of the Secretaries of State, War,Navy, Treasury, Commerce, and Interior), to a German request to purchase up to 10,000,000 cubic feet (280,000 m3) of helium made that impossible. Dr. Eckener responded that “ this decision means the death sentence for commercial lighter-than-air craft.” Although the Graf Zeppelin II made 30 test, promotional, propaganda and military surveillance flights around Europe between the airship’s launch in mid-September 1938 and its last flight 11 months later on August 20, made just 10 days before the formal start of World War II in Europe with the German invasion of Poland on September 1, 1939, and Sadly both the original Graf Zeppelin (LZ 127) and the Graf Zeppelin II (LZ 130) were both scrapped for salvage and their duralumin airframes and other structures to be melted down for reuse by the German military aircraft industry. The first supersonic land speed record was set by Andy Green in Thrust SCC (United Kingdom) on On 15 October 1997, exactly 50 years and 1 day afterChuck Yeager first broke the sound barrier in the Earth’s atmosphere. ThrustSSC, Thrust SSC, or Thrust supersonic car, is a British jet-propelled cardeveloped by Richard Noble, Glynne Bowsher, Ron Ayers and Jeremy Bliss. 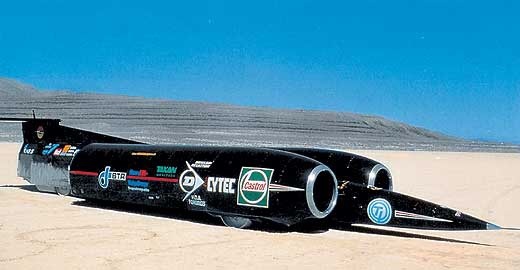 Thrust SSC holds the World Land Speed Record, set on 15 October 1997, when it achieved a speed of 1,228 km/h (763 mph) and became the first car to officially break the sound barrier. 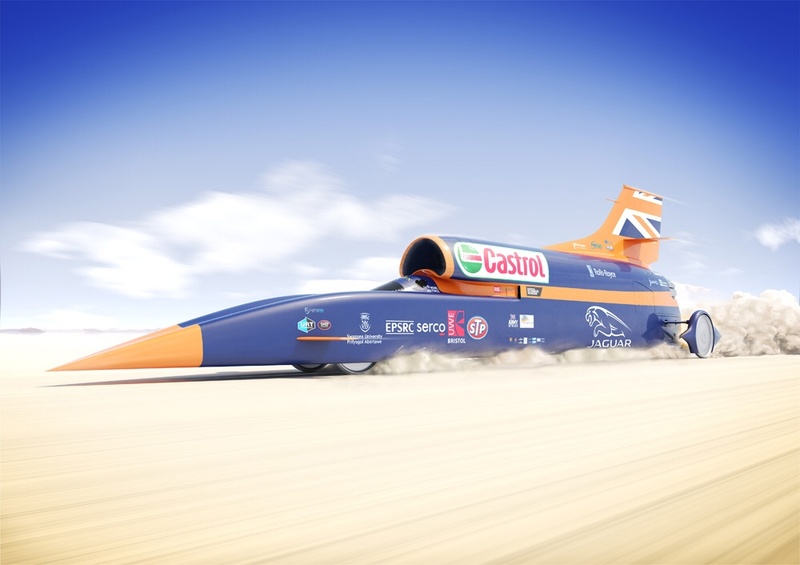 Richard Noble broke the world land speed record in 1983 with his earlier car Thrust2, which reached a speed of 1,018 km/h (633 mph). The date of Andy Green’s record came exactly a half century and one day after Chuck Yeager broke the sound barrier in Earth’s atmosphere, with the Bell X-1 research rocket plane on 14 October 1947. Both Thrust SSC and Thrust2 are displayed at the Coventry Transport Museum in Coventry, England. Thrust SSC is housed in a barrel-roofed hall. Visitors can board the pit trailer from which Thrust SSC runs were controlled, and can ride a motion simulator depicting a computer-generated animation of the record-breaking run from the perspective of Green.Several teams are competing to break the record, including Richard Noble’s Bloodhound SSC project and the North American Eagle project. 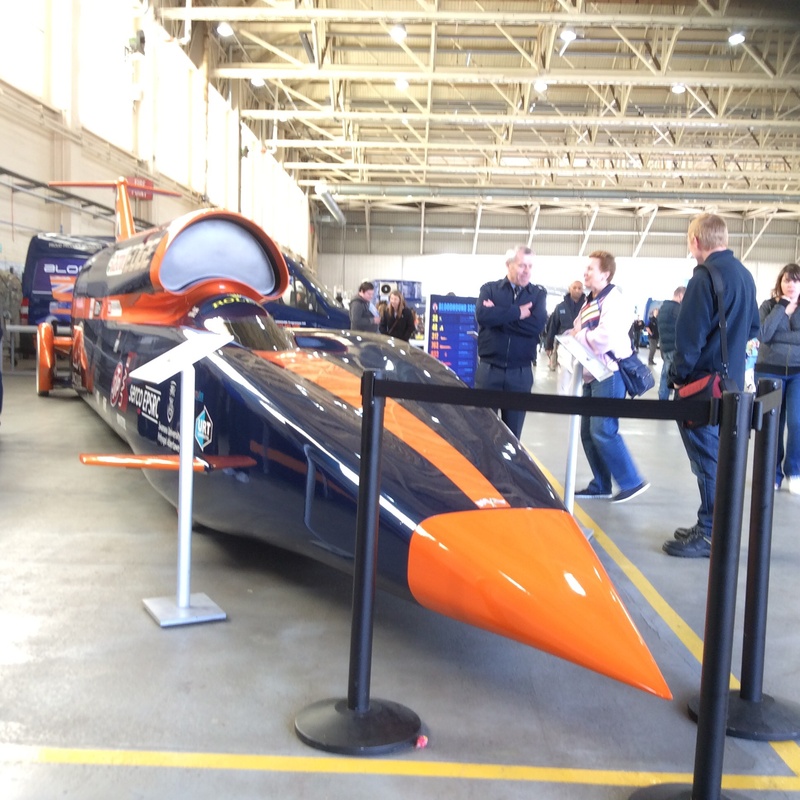 I was lucky enough to see the Bloodhound SSC At this years Cosford Air Show. English Novelist, humorist and lyricist, Sir Pelham Grenville Wodehouse, KBE was born 15 October 1881. His work includes novels, short stories, plays, poems, song lyrics, and numerous pieces of journalism. He enjoyed enormous popular success during a career that lasted more than seventy years and his many writings continue to be widely read. Despite the political and social upheavals that occurred during his life, much of which was spent in France and the United States, Wodehouse’s main canvas remained that of a pre- and post-World War I English upper-class society, reflecting his birth, education and youthful writing career. An acknowledged master of English prose, Wodehouse has been admired both by contemporaries such as Hilaire Belloc, Evelyn Waugh and Rudyard Kipling and by recent writers such as Stephen Fry, Christopher Hitchens, Douglas Adams, J. K. Rowling, and John Le Carré.Best known today for the Jeeves and Blandings Castle novels and short stories, Wodehouse was also a playwright and lyricist who was part author and writer of 15 plays and of 250 lyrics for some 30 musical comedies, many of them produced in collaboration with Jerome Kern and Guy Bolton. P.G Wodehouse also worked with Cole Porter on the musical Anything Goes (1934), wrote the lyrics for the hit song “Bill” in Kern’s Show Boat (1927), wrote lyrics to Sigmund Romberg’s music for the Gershwin – Romberg musical Rosalie (1928) and collaborated with Rudolf Friml on a musical version of The Three Musketeers (1928). He is also in the Songwriters Hall of Fame. Wodehouse sadly passed away on 14th February 1975 however his work continues to enjoy enormous popular success and is still widely read, and the musical comedies to which he contributed remain popular to this day.